I’ll never forget the day I stumbled into a tent at the long since defunct “Gig on the Green” and saw lead singer Dolf De Borst spitting out his machine gun style lyrics as he hoisted lead guitarist Christian Livingstone up on his shoulders to play some devilish guitar riffs with the utmost ease. 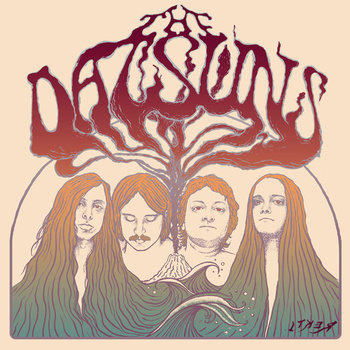 That was my first impression of “The Datsuns” and its safe to say since that day they are a band that have long held a little place in my heart. Well that festival may have gone the way of the Dodo, but 10 years and five albums later “The Datsuns” are very much still alive and kicking, sounding as energised and immediate as ever. Lead singer Dolf De Borst recently took the time to chat to us about the new album “Death Rattle Boogie”, his love of King Tuts and the power of Buckfast. It’s been almost four years since the release of “Headstunts”, did it ever feel like “Death Rattle Boogie” would never be completed and released? Dolf – “Yes. Making records can be frustrating and this time we had plenty of that, mostly because of the logistical challenges in getting everyone together. The new album is out on October 15th almost ten years to the day since your debut was released, can you tell us a little bit about it? Who produced it? Where it was recorded? How the recording process went? Dolf – “We started working on songs in-between touring the last album and a little on our own too, sharing files and ideas over the internet. Once we thought we had enough ideas together we decided to get recording, perhaps a little too quickly. The album recordings were split over a few sessions in two different studios, Gutterview here in Stockholm and Roundhead in New Zealand. Gutterview is a studio set up by Nicke Andersson(Hellacopters), Fred Estby(Dismember) and myself a couple of years back. Firstly to record our own projects but also other like minded groups when the right project comes up. The original idea was to record the entire record in January of 2011 there. We probably recorded about 15-16 ideas over a two week period with Nicke co-producing with us. Everyone then headed back to their respective corners of the world and we sat on it for a while. I still had a lot of vocals and overdubs to finish. We decided some of the versions were not really what they could be. I think we perhaps leapt into recording, super eager but not totally finished with a lot of the songs. Mostly my fault I guess as I wasn’t satisfied with some of the keys and lyrics. Our next opportunity to record came when we toured NZ a little later that year. Roundhead studios is an amazing studio in Auckland built by Neil Finn (Crowded House, Spilt Enz). We had a few sessions there and re-recorded a few tracks and recorded all the new songs that always crop up. What is the title of the album in reference too? Certainly after listening to it, it surely can’t be anything to do with the band itself as you seem as energised and alive as ever. After listening to the new album and really enjoying it, I kept going back to “Wander The Night” and hearing a bit of a Doors influence in it, is that something you were consciously aiming for or just the natural progression of the song? Have you got any UK tour dates planned for the run up to the release of the album? Another Scottish date at King Tuts maybe? I’ve seen you play there a couple of times, is it a venue you enjoy playing? My friend also says please always play Glasgow instead of Edinburgh. I’m not quite so biased but anyway. You played Hop Farm this year, how did you enjoy the Festival? Did you get a chance to road test some of the new material live? What new songs have the band been enjoying playing live? These next three questions which we here at Up Late At Night Again aim to ask everyone that we interview this year, the best answers will be collated for an end of year piece. If you could have written any song in history what would it have been? and why? If you could share a cheese fondue with anyone living or dead (not including Jesus because he doesn’t exist) who would it be? If you had to punch one of either Paul McCartney or Mick Jagger in the face who would it be and why? Thanks to Dolf for taking the time to answer our questions, look forward to hopefully seeing you on that King Tuts stage in the not too distant future.